Beverly's Official Blog | News and findings from world of crafts, scrapbooking and more: Inspiration from our customers! "Great, fast service, fantastic prices. Received the fabric, made some cafe curtains for a new room - here's a picture. 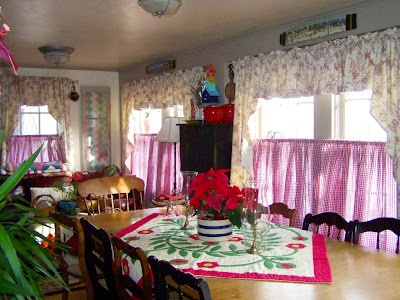 Our house is a Cape, nearly 300 years old furnished with antiques. Thank you for such terrific service." Looks fantastic Pauline, well done! We are always looking to hear stories about how creative people are being and what kind of wonderful ideas they are putting together. If you would like to share your pictures and projects with us, just drop us a line! We might just feature it on our blog!! !